The human costs of smoking, drinking too much alcohol and an unhealthy diet are widely known, with consequences ranging from heart disease and type 2 diabetes through to many types of cancer. But tobacco, alcohol and obesity also come with a wider social and economic cost. With debates about public sector funding never far from the headlines, health economists need to ensure that decision makers understand the full cost of these unhealthy behaviours and use that to make the case for investment in public health interventions. Why do we look at the costs to society of something like smoking? Adopting a societal approach for quantifying the cost of unhealthy behaviours allows us to consider all the potential impacts on society. This approach is also in line with guidance from HM Treasury in their “Green Book” which sets out how to evaluate policies, projects and programmes. As economists we identify areas of society where resources are allocated inefficiently. We refer to this as ‘market failure’, and in these situations government intervention is justified to benefit society as a whole. If the costs of the consumption and/or production of a commodity like tobacco fall on a third party this is referred to as a ‘negative externality’, a type of market failure. For example, the negative health impacts that fall on non-smokers because of their exposure to second hand smoke. When it comes to a market like tobacco, the cost that falls on society is higher than the market price of the commodity and as a result the good or service is over-consumed and we need to take action. How do we calculate these costs? Quantifying the costs (and benefits) of behaviours is challenging and there will always be some debate about which aspects should and should not be included in any economic model. But as long as the assumptions are made clear, it’s then possible for people to decide on the assumptions they agree with. In any analysis it’s important to be clear from whose perspective costs and benefits will be considered, and as already discussed, at PHE we typically take a societal approach. An alternative could be to take a governmental approach, considering just the costs and benefits to the exchequer i.e. government spending and tax revenues. This would however, exclude the wider costs (and benefits) that may fall on society, such as productivity losses. Which parts of society are included in a societal approach? Ideally all the costs and benefits that fall on society and the economy as a result of unhealthy behaviours would be quantified but this is not always possible. This is often due to data availability or a lack of a methodology to monetise specific impacts. In PHE we are keen to ensure that there is consistency in how we estimate the total economic and social costs across key policy areas such as tobacco use, alcohol consumption and obesity. The table below shows that there is currently a high degree of consistency, but not 100% across policy areas. We are therefore continuing to work in PHE to ensure that a common approach is adopted as far as possible, and to explain any variations in approach where this is justifiable. It’s challenging to calculate the social care spending that is attributable to certain conditions or risk factors so we currently don’t include social care costs, whereas with NHS costs we can look at both the primary and secondary healthcare costs of health conditions related to these behaviours. It’s worth noting that some social care smoking estimates exist in the Tobacco Control Plan. Calculating the social care costs of unhealthy behaviours is something we would like to do when PHE revises its cost estimates as this will demonstrate that they put pressure on Local Authority spending as well as the NHS. This addition would help complete the picture from a societal perspective of the costs of these behaviours. What other impacts could these unhealthy behaviours have on society? Wider economic costs are usually difficult to quantify and are not therefore always included in published estimates but include, for instance, the cost to the criminal justice system as a result of alcohol-related crime. PHE’s estimates also include figures for productivity losses. For example with tobacco we include the economic output lost as a result of smoking breaks, as well as sickness absence and unemployment related to smoking. It is important to acknowledge that the alcohol, tobacco and food and soft drink industries contribute to the economy through employment opportunities, tax revenues and adding to the country’s GDP. However it’s also difficult to assess the overall costs and benefits to business and the wider economy if consumption patterns change as a result of public health interventions. For example people may switch consumption away from certain unhealthy commodities and as a result increase consumption of other goods or services. This means that while one sector may see a reduction in activity and profits, another might benefit, so the resulting impact on employment and the wider economy is relatively ambiguous and therefore difficult to quantify. The potential health impact of these switches in consumption further complicates matters as individuals may move to consuming substitute goods that may also be harmful to health. How could this work develop further? There are many areas where data collection is challenging. For example it’s not just employment and productivity that’s impacted by ill-health, as illness may also prevent people from providing informal care or volunteering. Public health interventions also have goals which go beyong just preventing ilnness, such as improving wider societal well-being and reducing health inequalities. For example, social cohesion may improve if alcohol interventions lead to a reduction in crime and disorder, and a safer environment could also encourage individuals to get out and about and be more active. These types of impacts are, however, very difficult to monetise and as a result are not usually included in estimates. What is less debatable is that we, as public health professionals, have a duty to reflect the impact on mortality and morbidity of unhealthy behaviours in our models through standard health economic techniques, for example the use of Quality-Adjusted Life Years (QALYs). This helps to ensure that policy and decision-makers are made aware of the capacity to benefit from public health interventions and to ensure that the people most at risk, who are often in the most deprived communities, receive the care and support they need. Irrespective of the size of the social and economic burden of certain lifestyle behaviours, there is overwhelming evidence to support the value for money of many public health interventions. In PHE we have produced several tools and resources that are intended to present the available evidence in as helpful a way as possible. 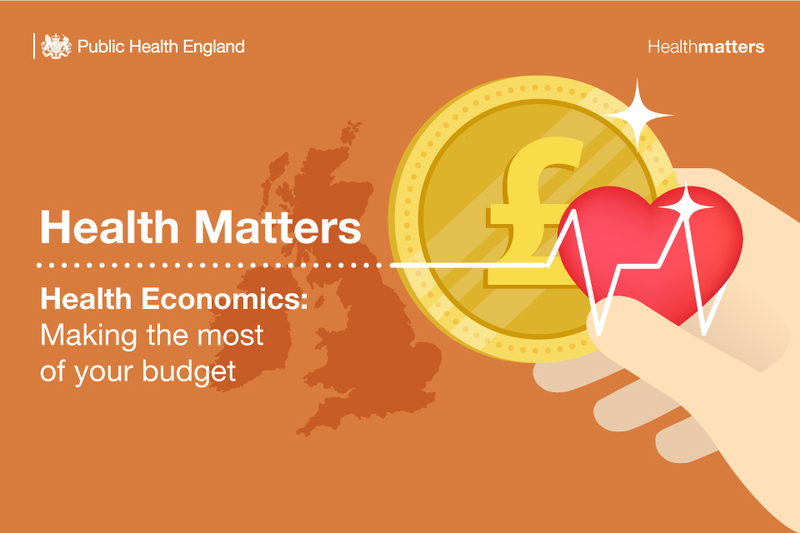 This blog supports our latest edition of Health Matters on “making the most of your budget”. Health Matters is a resource for professionals, which brings together the latest data and evidence, makes the case for effective public health interventions, and highlights tools and resources that can facilitate local or national action. Visit the Health Matters area of GOV.UK or sign up to receive the latest updates through our e-bulletin. If you found this blog helpful, please view other Health Matters blogs. With PH now in Local Authorities it is a shame that the effect of unhealthy lifestyles on social care has not been explored. There can at least be the perception that LA's are being asked to fund initiatives that save the NHS money. It would be much easier to fund initiatives through the LA if savings to them were also made explicit.